Tonight's dinner is a manifestation of a common daydream brought on by May's warming weather. Think breezy late afternoon brunch on a stone terrace. (It gets better if, in the daydream, you’re looking at a babbling brook from under the brim of a pale-yellow hat.) Now translate that into a fast, simple weeknight supper. We dreamt up this beautiful torte -- bright from lemon zest, springy from mint and peas -- with this light, colorful salad alongside. You supply the mimosas. And the yellow hat. We’re assuming you have quite a few ingredients already on hand, but if not, they’re all pantry staples. If you don’t have the following, go ahead and stock up -- we’re guessing you’ll need them for tomorrow, or the next night: balsamic vinegar, good olive oil, “loads” of black pepper, butter, shallot, salt, nutmeg, eggs (you'll need 4), and a lemon. The salad can be thrown together last minute, right before you're ready for it, so the main task is the torte, which is basically a crustless quiche. 1. Before you do anything else, get your oven working at 375 F. You can also prep a quick salad dressing with your olive oil, balsamic vinegar, and black pepper. 2. Time to focus on your torte: start in on steps 2 and 3 of the recipe; this is the most work you'll do all night. From here, the oven does the rest. 3. Compose your salad. (Read: toss ingredients into a bowl. Bonus points if your bowl is a pretty, spring-sppropriate color.) As the torte cools slightly, dress your salad, and you're done. Now, go ahead, daydream. 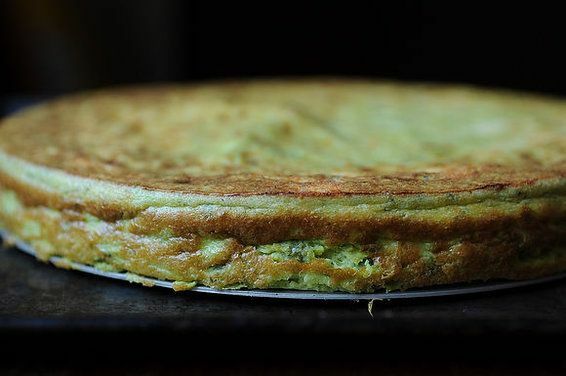 I've had my eye on that spring pea torte since the dead of winter -- so psyched to finally make it now that it's spring!